Facebook’s recent F8 conference focused heavily on its Messenger app. It currently allows users to use a variety of bots to arrange or obtain information more easily. Getting news, buying flowers, booking cabs or arranging air travel can now be done via a text message anytime of the day or night. It covers a wide range of applications but they can be summarised as programs that perform automated tasks, many without human interaction, but some as a point of interaction with human inputs. Bots like the Wikipedia's ClueBot monitor updates to the site and reverses edits that are classified as vandalism. It can check and correct as many as 9000 edits a minute and learns over time to be increasingly accurate in what it identifies. Search engines use web crawlers that read and index the content of websites. Google’s search engine uses a natural language process to try understand what is being asked rather than simply find matches for the words typed in the input box. For example if you ask “Who is the Batman?” it knows that you are talking about a fictional character but that you most likely looking to know who plays the role and returns the names of all the actors that have played the role. If you ask “Do I need an umbrella tomorrow?” it will return a weather forecast for where you are with the next day highlighted even though you did not expressly ask for the weather or specify where you are. Microsoft has a caption bot that will describe what it sees in a picture and other that will determine if there is a person in it and what their gender and age is. 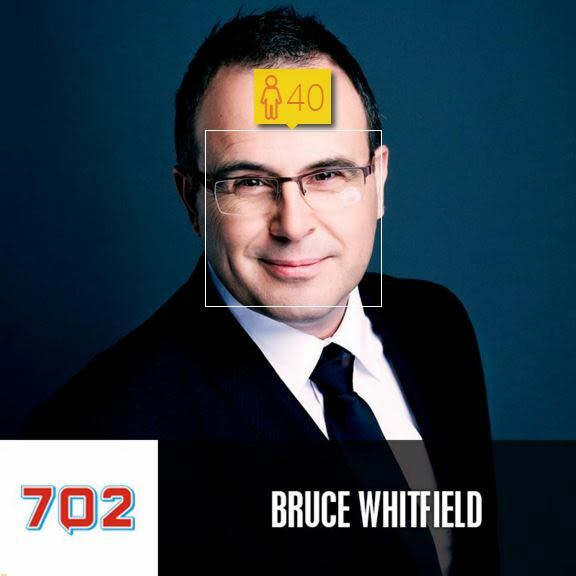 The How-Old bot correctly identified Bruce Whitfield's age (at the time the picture was taken). The KLM messenger bot tracks all the details with your flight, ticket details, seat selection, dietary needs and updates on the departure time all while you can still message friends and look at pictures of cats. X.ai aims to makes setting up meetings easier when someone requests to meet, you simply cc amy@x.ai and “she” will follow up and check your calendar for free time and check which works best for the person that would like to meet you. It would be interesting if two people with the bot look to arrange a meeting with each other. It is a useful service, but this is also where we realise that there is still some way to go. The bot has a human checking all their moves, it is quite reliable but not quite there yet. This was a similar response for those using the Facebook bots, they are a little slow sometimes and often don’t understand. So rather than taking jobs away in the short term the new job of botsitter will create work for humans in the short term and even when they do get good enough to not need a sitter they will be doing work that few humans would want or would be able to do for as long and as accurately as humans. One of the most impressive demonstrations of just how good AI can be is illustrated with a project to try create a painting to match Rembrandt style that might impress the master himself. This is not a flash in the pan and while the tipping point may be a year or two away, it will not be too long before people will not only lament that fact that we don’t talk to people face to face anymore, they will remember fondly when we interacted online with other humans.